The new 20nm 128Gb MLC NAND device doubles the storage capacity and performance of the companies' existing 20nm 64Gb NAND device. Intel and Micron continue to lead the industry with the most advanced NAND production process technology, announcing mass production of their 20nm 64Gb NAND flash. The industry's first monolithic 128Gb part can store 1 terabit of data in a single fingertip-size package with just eight die—a new storage benchmark that meets the ongoing demand for slim, sleek products. The companies' 20nm NAND is the first to use an innovative planar cell structure that overcomes the scaling constraints of standard floating gate NAND. SANTA CLARA, Calif. and BOISE, Idaho, Dec. 6, 2011 -- Intel Corporation and Micron Technology, Inc., (Nasdaq:MU) today announced a new benchmark in NAND flash technology — the world's first 20 nanometer (nm), 128 gigabit (Gb), multilevel-cell (MLC) device. The companies also announced mass production of their 64Gb 20nm NAND, which further extends the companies' leadership in NAND process technology. 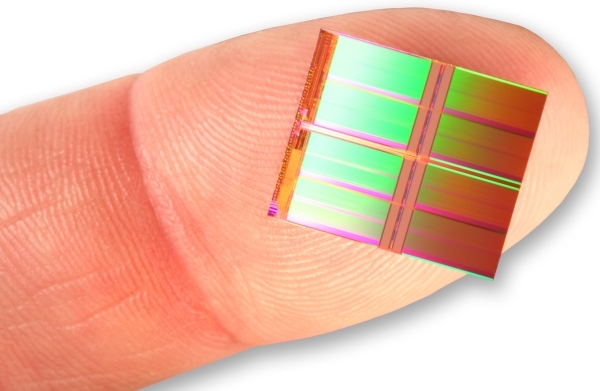 "As portable devices get smaller and sleeker, and server demands increase, our customers look to Micron for innovative new storage technologies and system solutions that meet these challenges," said Glen Hawk, vice president of Micron's NAND Solutions Group. "Our collaboration with Intel continues to deliver leading NAND technologies and expertise that are critical to building those systems." The companies also revealed that the key to their success with 20nm process technology is due to an innovative new cell structure that enables more aggressive cell scaling than conventional architectures. Their 20nm NAND uses a planar cell structure — the first in the industry — to overcome the inherent difficulties that accompany advanced process technology, enabling performance and reliability on par with the previous generation. The planar cell structure successfully breaks the scaling constraints of the standard NAND floating gate cell by integrating the first Hi-K/metal gate stack on NAND production. "It is gratifying to see the continued NAND leadership from the Intel-Micron joint development with yet more firsts as our manufacturing teams deliver these high-density, low-cost, compute-quality 20nm NAND devices," said Rob Crooke, Intel vice president and general manager of Intel's Non-Volatile Memory Solutions Group. "Through the utilization of planar cell structure and Hi-K/Metal gate stack, IMFT continues to advance the technological capabilities of our NAND flash memory solutions to enable exciting new products, services and form factors." The demand for high-capacity NAND flash devices is driven by three interconnected market trends: data storage growth, the shift to the cloud and the proliferation of portable devices. As digital content continues to grow, users expect that data to be available across a multitude of devices, all synchronized via the cloud. To effectively stream data, servers require high-performance, high-capacity storage that NAND delivers, and storage in mobile devices has consistently grown with increased access to data. High-definition video is one example of an application that requires high-capacity storage, since attempting to stream this type of data can create a poor user experience. These developments create great opportunities for high-performance, small-footprint storage, both in the mobile devices that consume the content and the storage servers that deliver it. Intel and Micron noted that the December production ramp of their 20nm 64Gb NAND flash product will enable a rapid transition to the 128Gb device in 2012. 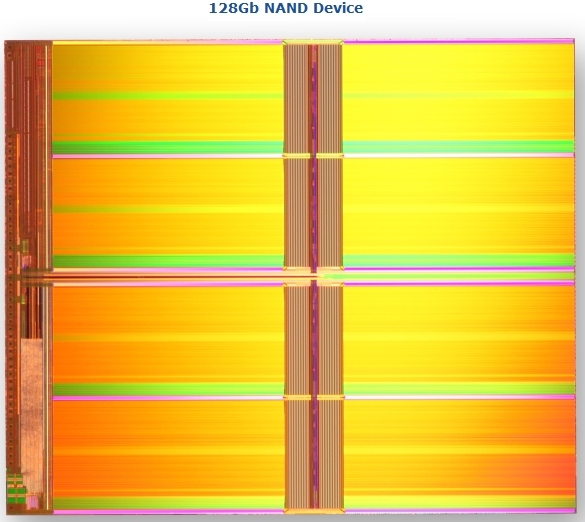 Samples of the 128Gb device will be available in January, closely followed by mass production in the first half of 2012. Achievement of this milestone will further enable greater densities and overall fab output, while also helping the companies' development teams cultivate the expertise required to design complex storage solutions and refine future technologies.